this script assign lightmaps to every selected objects. you must insert lightmap path, and you can choose uv channel e texture formats. to assign a shortcut: "customize user interface" -> "mainUI" -> "compariello"
* in this case, the script works with vray lightmap suffix (max 2008 & 2009). 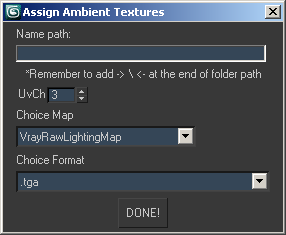 if you want to use with other ambient texture suffix, write a comment!! ** just you must have materialID equal to number of multimaterial list.